In the 1930s the Danish American Women’s Association spearheaded an annual radio broadcast in celebration of the birthday of Hans Christian Andersen. Aimed at New York’s school children, it featured information on the author’s life, songs by Andersen and, most importantly, a reading of his beloved fairy tales. The event gained wide-spread attention when, on April 1st, 1936, Mayor Fiorello LaGuardia pronounced the next day “Han Christian Andersen Day” and instructed children to listen to the program the following morning. Children continued to tune in throughout the war years when a War Bond of $25 was awarded to the child who created the best essay on Andersen. 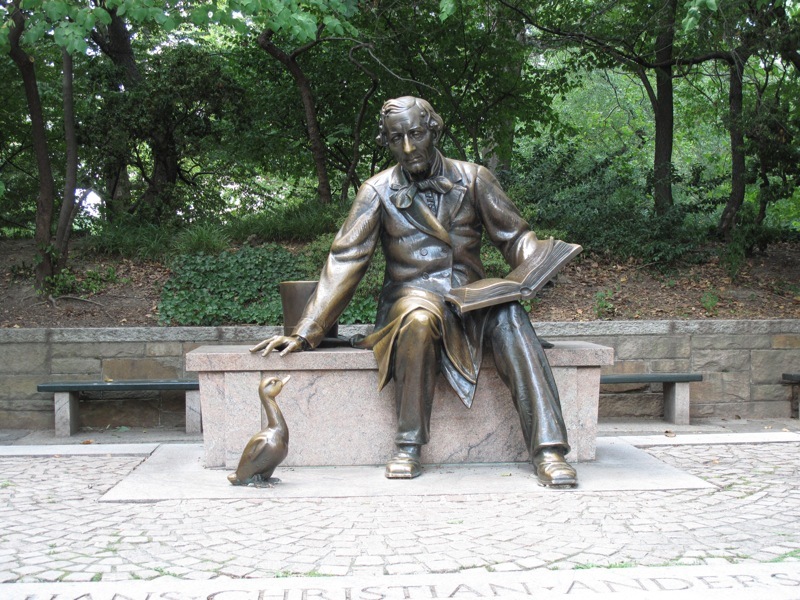 With Andersen’s 150th birthday approaching, the DAWA formed a committee in 1952 to investigate the creation of a statue to Hans Christian Andersen in Central Park as a “story telling center.” The members of the “H. C. Andersen Statue Fund” feared from the start that they would have a difficult time convincing Parks Commissioner Robert Moses. Moses had refused for thirty years to add any new statues to the park. Yet there was still the Parks Commissioner to deal with. Fund raising started immediately. Georg John Lober, upon receiving his first payment of $1000, revised his cost estimate to $67,000. Despite earnest appeals and repeated fund raising events, the committee faced difficulties raising the necessary funds. In 1954 the idea was formed to involve Danish school children – their contributions making the statue a gift from Danish school children to American school children. It was decided that the statue would be a gift from the children, while the “story telling center” would be paid for by the American contributions. On July 26, 1955, the total contributions from the Danish children was reported: $15,000. The statue fund was still substantially below the figure necessary. Cast in the Modern Art Foundry in Queens, Lober’s statue depicts a larger-than-life Hans Christian Andersen seated on a stone bench with a copy of The Ugly Duckling on his knee. At his feet, the ugly duckling himself stares up at the author. Danish entertainer Victor Borge read the first story from the site to children, followed over the years by performers including Fanny Hurst, Celeste Holm and Eva la Gallienne. In 1964 two 19th Century Danish street lamps were donated by the City of Copenhagen that flank the statue. In reciprocation Parks Commissioner Henry stern gave two New York City streetlamps to Dantes Plads in Copenhagen. Over the years King Frederik and Queen Margrethe II and well as other Danish royals have visited the statue, the knee of which has become polished by the rumps of enchanted children who sit on its lap. The wife of Denmark’s Premier Jens Otto Krag read “The Princess and the Pea” here in 1964. In 1973 the ugly duckling was stolen from the statue, breaking the hearts of New Yorkers city-wide. Dorothy Strelsin, whose apartment looked down on the statue on 5th Avenue, offered to donate the money to replace the bronze baby swan. Luckily, the piece was recovered and restored. No longer simply an annual event, the free storytelling is done every Saturday at 11:00 am from May through September when bright-eyed children and parents listen intently to the words of the famous author. The statue is located near 72nd Street and 5th Avenue in the park. Lovely article. Just to not disappoint anyone, story telling starts in June (not May) and goes on though September. Hans Christian Andersen Story Telling Center, Inc.